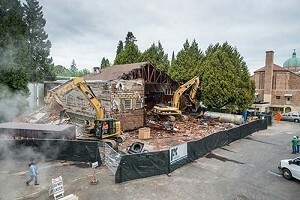 On May 13, the old gym came down to make way for a new building for the SSMO Ministries Corporation maintenance workers, who serve Valley Catholic School, Maryville Nursing home and the other projects on campus. 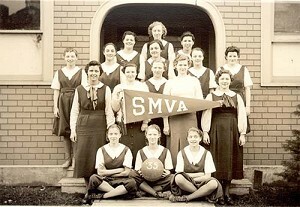 For many years, our school was known as St. Mary of the Valley Academy, then St. Mary of the Valley School. Today, it is Valley Catholic, serving pre-K through grade 12 on one campus, not to mention the convent and nursing home. When the high school building opened in 1969, high school and middle school competitions moved to that facility. Elementary school basketball games – through the Catholic Youth Organization – were held in the old gym until the Valley Catholic Athletic Center opened in 2006. Since then, the old gym has mostly been used for storage.